“Loneliness is worse than death. For a year now Alice has been visiting Soul Beach, a website where she can talk to, touch and laugh with her sister again, despite her sister being dead. For a while she feels like she has been followed wherever she goes and Soul Beach is the only time she truly feels safe. However when something happens that tips her parents over the edge she is banned from the internet and forced to go to therapy. But that doesn’t stop Alice, determined to discover who her sisters killer is and convinced the only way to find out is to visit Soul Beach, she sneaks out to visit the Beach from a friends house, but by doing so something happens and it would appear that there’s a storm brewing in paradise. I have adored each book in this series and I was dying to find out who the killer was, just like Alice (sorry for the bad pun there, not intended!) I dived to Soul Storm as quickly as I could and like the others it was a barrage of mystery, danger and intrigue, and I loved every minute. The story that runs through this entire series is brilliant and it really is murder mystery at its best. I loved the way it kept you guessing and I loved the way the killer was revealed towards the end of this book. I won’t go into detail in order not to spoil the book, but basically I had convinced myself it was one character but was hoping I was because I thought it was too obvious. I loved that I kept second guessing nearly every character that came onto the page and at one point I had decided that maybe we didn’t even know the killer at all from the previous books, maybe they were a new character… I’m not going to tell you if that is the case though, you’ll have to read the books for yourself to find out! The story is focussed on Alice and the grief of her sisters death, her focus on finding the killer and in Soul Storm she is desperately searching for that closure, but theres a second element of closure needed too and that was from Soul Beach itself. Alice had become kind of obsessed with the beach and I thought in book two it was getting a bit crazy for her to be on it constantly. I liked that book three had more going on outside of the beach and it worked really well to develop Alice into a character herself, without her sister and Danny there beside her. I have to say that there are aspects of the book I found a little crazy. I know there are 19 year old millionaires in the world and its plausible that one could jet a mate off the Thailand last minute. However I found it kinda heartbreaking that Alice would do that to her parents. Her parents are overbearing in parts of the book, especially her mum, however you have got to remember that they lost their first born not a year ago and then their second born keeps getting into life threatening situations… that must be tough without said second born jetting off to Thailand without telling them! Other than this I found Soul Storm as incredible as Soul Beach and Soul Fire. I will definitely recommend them to people, especially now that the third and final book has been released. If you are going to start the series do so with all three books at had because you will be itching to find out the truth, but it is worth the wait until book three! 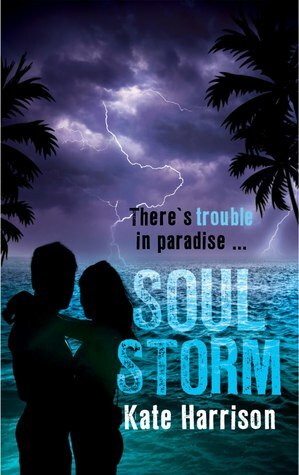 Soul Storm was published on August 1st by Indigo. My copy was sent from the publisher in exchange for an honest review.